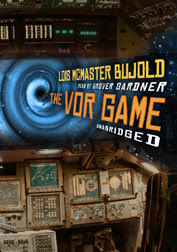 The Vor Game by Lois McMaster Bujold was my first Audie nomination, in 2006. There's not much I can say about this series that hasn't already been said by Lois' fans. It's a wonderful joy ride, all the way from Shards of Honor to the recently-released Cryoburn, along with the numerous spin-off books and novellas. I'm not much of a sci-fi fan, but you don't have to be to enjoy these witty, exciting space operas featuring the ever-resourceful and ever-heroic Miles Vorkosigan. He's a marvelous invention and he grows more complex and endearing with every book. I started recording the series with The Warrior's Apprentice, the first book that features Miles. The series really begins with Shards of Honor and Barrayar, which relate the story of Miles' parents. I only recorded these recently, and was under the impression that they had been written later to flesh out the back story, but Lois actually wrote them all in order, clearly with a very grand scheme in mind. For me, they provided wonderful insights into characters I was already familiar with, and I'd recommend that newcomers to the series start with The Warrior's Apprentice, complete the Miles books, then read the first two. To me, they are a lot more rewarding when you understand what's to come. That first nomination, by the way, was the year I hosted the Audie Awards in Washington, D.C. I was working on a project for GraphicAudio in Bethesda, and one of their people was organizing the ceremony that year. She stopped me on my way into the studio one morning and asked if I would be willing to host the Awards that year. I was flabbergasted. Apparently Tony Roberts couldn't make it and they needed a last-minute substitute. I gladly accepted, knowing that it would be the one and only time I would be asked to fulfill this function. I say that because I've hosted and presented at various theater things over the years and I never like the scripts they give me, so I make up my own. This doesn't go over well with organizers and I'm never invited back. That turned out to be the case, but it was a fun evening, except for the opening. Dinner had been served and, knowing that the ceremony itself was about to begin, I made a trip to the restroom. On my way I stopped at the check-in table and told one of the people there not start without me. I came out five minutes later and this same person said, "They started without you." I thought it probably wasn't going very well absent the host, and sure enough, upon entering the dining room I noticed a pall of silence, an empty podium and two hundred pairs of eyes staring my way. There was only one thing to do. I strode camly to the dais, mounted the steps, stepped up to the microphone and said, "I had to go to the bathroom." By the way, I didn't win that year. Simon Vance, who was sleeping on my sofa, took the category and dashed my first hopes for audiobook glory. ...for which I apologized enough that Grover allowed me back onto the sofa that evening - otherwise I might have been out on the street for the rest of my stay!